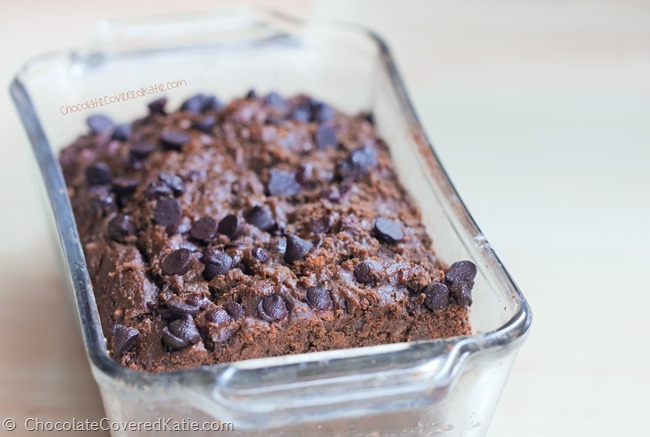 Deep, rich, decadent, gooey dark chocolate coconut banana bread. If I wanted you to think I was super skinny, I wouldn’t have specifically pointed it out that I’ve gained weight. Sometimes lines are not straight in photos; sometimes the camera flash causes weird shadows; sometimes I stand at an awkward angle or an iphone pic will look distorted. But I am very happy with my body the way it is, and I wanted to make that clear because promoting positive body image is really important to me. I hear so many girls walking around calling themselves fat or saying they feel guilty for eating dessert, and magazines proclaim “New Year, New You” as if there’s something wrong with the old you and only girls who are a size 0 or have supermodel proportions deserve to be loved. In my previous post, three separate people accused me of photoshopping the pictures of myself… but those photos are actually just screenshots from the online clip, and anyone can take the exact same screenshot for themselves. I found this kind of funny, so I had to point it out. Speaking of photos, writing this post was really difficult. 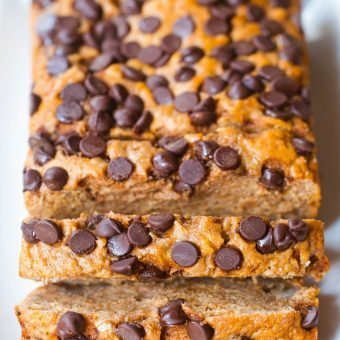 Every time I looked at that first picture of the banana bread—chocolate chips staring back at me through the computer screen—I wanted to quit writing and go eat banana bread instead. Did not help that my apartment smelled like chocolate. 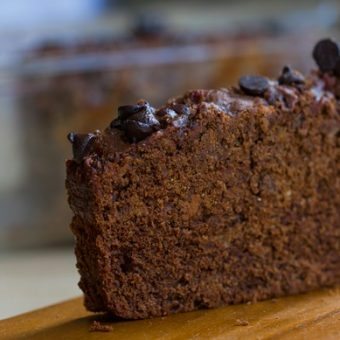 For this particular recipe, I used the recipe for my favorite Chocolate Banana Bread and added THREE kinds of coconut. So really, I could technically call this Triple Coconut Banana Bread. And three coconuts are much better than one. If you don’t have one of the three forms of coconut, feel free to leave any of them out. Obviously it will be more and more coconutty, the more types of coconut you add; but the original recipe without coconut is delicious too. 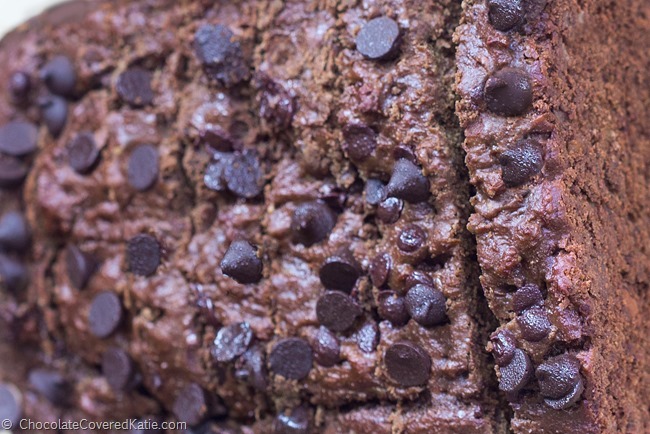 Basically, with chocolate chips and banana bread, it is hard to go wrong! Measure banana after mashing, not before. Preheat oven to 350 F and grease a 9×5 loaf pan very well, going up the sides. In a large mixing bowl, whisk together the ingredients from banana to the sugar/stevia (the first 8 ingredients). In a separate bowl, combine all remaining ingredients and stir very well. Pour dry into wet ingredients, and stir until just evenly combined. Transfer the batter to the loaf pan and spread out evenly. 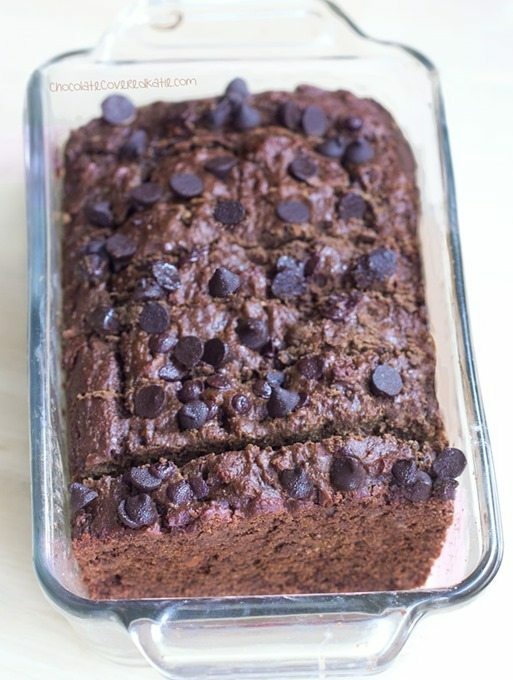 If desired, sprinkle chocolate chips over the top of the banana bread and press down. Bake 35 minutes. Then turn off the oven but DON’T open the door! Let sit 10 additional minutes in the closed oven before removing and slicing. (Some readers have said their bread needed additional baking time. This can sometimes happen, depending on climate where you live and differing oven calibrations. If this happens to yours, just turn the oven back on after the 10 minutes are up and continue baking until a toothpick inserted into the center of the banana bread comes out clean.) 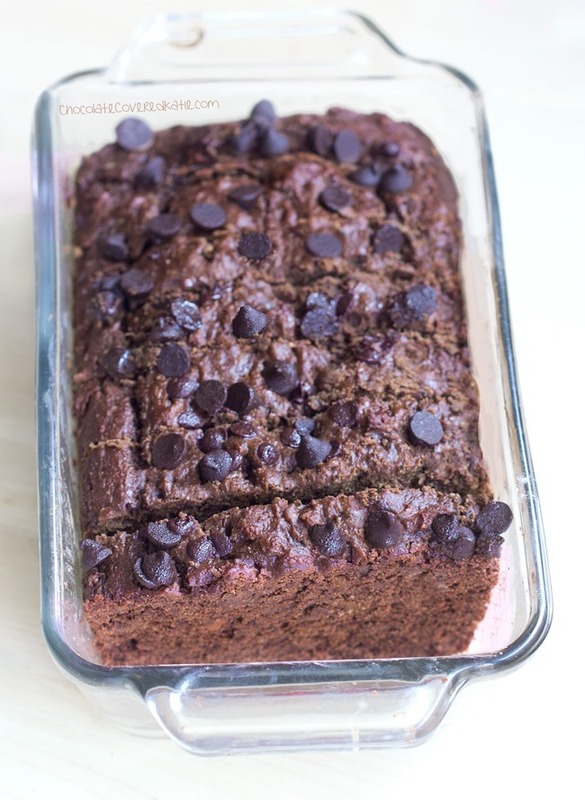 This banana bread tastes even sweeter the next day, and it freezes well after slicing. 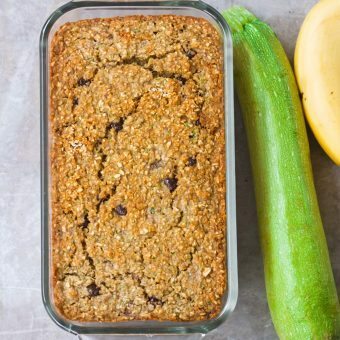 Zucchini Banana Bread – NO Flour Required! Katie, I love the way you support healthy body image for all women. You are right that the phrase “real women have curves” isn’t as supportive as it first appears. I am a curvy lady who will always be so. As I work to lose some weight (much needed) my ten year old daughter told me (in all seriousness) not to lose too much as I would look weird if I were super skinny! I laughed and told her I appreciated the sentiment. My daughter has an entirely different body type than I do. She will always be long and lean. She may never have the same kind of curves I have, but I focus on teaching her to be healthy through eating and exercise as well as understanding that we are all made different! 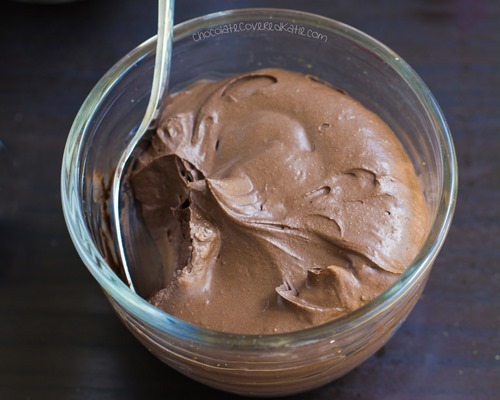 This looks amazing- can’t wait try it! Also loved seeing you on Dr. Oz- the screenshots you pulled do not look any different than how you looked on the episode, some people need better things to do 😉 Thank you for promoting a healthy body image through your great recipes! It says 1 2/3 cups of mashed bananas in the ingredient list, but 2 cups in the instructions. Which is correct? So sorry about that! 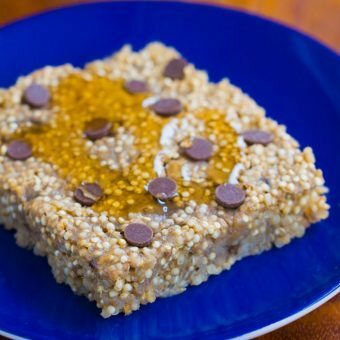 The ingredient listing is correct, so 1 2/3 cups banana. Instructions are fixed now as well. So how may bananas does 1 2/3 cups usually work out to? It took me three largish bananas. I wonder how using coconut flour would work for some extra coconutty goodness. I guess I know what to do with my ripe bananas now 😀 I usually make normal banana bread but this recipe looks interesting! You just keep doing what you are doing. I appreciate your wonderful recipes and share them with my family and friends. You blog is wonderful. Seriously. Just delete those people and ban them from your site. They obviously have issues and are not contributing in a positive manner at all. You have my heartfelt support always! Can’t wait to try this bread with my grand son. I’m sorry people continue to give you a hard time about the body God gave you. I often remind myself: for every rude person I encounter, I’ve met 4-5 who are wonderful. Have a great day, Katie. I appreciate all you do to make my world a little sweeter (literally). I seriously cannot believe that people would comment those things. Do NOT let them bother you. The comments are absolutely ridiculous. In my opinion, you are the most talented blogger out there, and I cannot thank you enough for all of the hard work that you put into this blog! And thank you for all of the AMAZING recipes that I make weekly! You’re the best! I love your blog Katie. I have been reading it for years and have always found you to promote not only a really healthy body image but a sincerely positive and meaningful lifestyle all round in everything you write and all your great recipes. I’d say what you contribute is genuinly one of the most psychologically balanced, relaxed but fun creative blogs on heathy eating out there. Thank you for being a radiant joy-giving ambassador, and please keep doing what you’re doing just the way you are. With gratitude and love from a very happy chocolate lover from England! Katie, thank you for your promotion of positive body image for women of ALL SIZES! I am a very petite, five-foot tall woman who is often not taken seriously as an adult because of my flat figure and short stature. Even though I’ve done the work of people nearly twice my size on chainsaw crews and on backcountry mountain trail-building crews, people still look at me and automatically assume I’m weak just because I’m small. It’s infuriating, and I know better, from my own experience not to judge anyone based on their body shape! You don’t have to be huge to be strong, or thin to be beautiful, or any specific shape or size to be loved. You just have to be you! Hey, the more coconut, the better! Also, those screenshots do not look photoshopped at all. Just lots of false accusations! Anyways, will definitely look into this recipe! I made this today. It just came out of the oven and is delicious! It’s nice and rich too, so I can get my “chocolate fix” without needing to eat a bunch. Thanks for giving so many options for ingredients too! I logged on to find Wally’s Chili recipe (which I should have memorized by now – it is my favorite chili!) and was very quickly distracted by the picture of chocolate bread. Oh- there’s coconut in there too, and banana’s? Even better! I actually went to go check my coconut milk stash before remembering my original purpose! Thank you! !